Laurionite, [formula – PbCl(OH)] is a lead halide mineral. 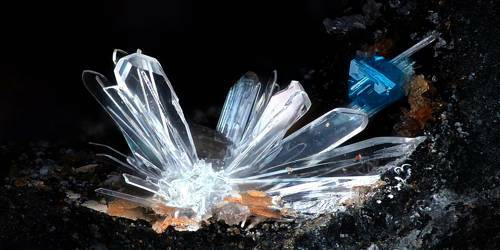 It is a colourless mineral composed of basic lead chloride, occurring in prismatic crystals; it is dimorphous with paralaurionite. 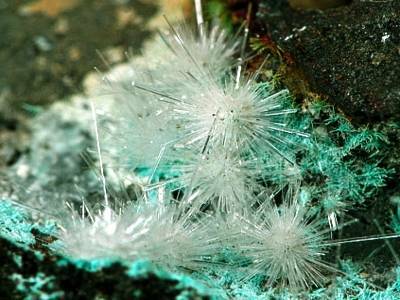 It forms colourless to white crystals in the orthorhombic crystal system and is dimorphous with paralaurionite, both members of the matlockite group. It is a basic lead chloride found in prismatic crystals at Laurion, Greece. It was first described in 1887 for an occurrence in the Laurium District, Attica, Greece, and named after the town Laurium. Laurionite forms small colourless vitreous to adamantine crystals often with distinctive V-shaped striations on the prism faces. Crystals are prismatic to acicular and brittle. Occurrence: Produced by the action of saline water on lead-bearing slag. In the oxidized zone of lead-bearing mineral deposits. It occurs as an oxidation product in lead ore deposits and is also produced on lead-bearing slag by reaction with saline solutions. It can be found in, additionally, Italy, Germany, South Africa, England, Wales, Turkmenistan, Australia, and the United States, among a few others. Laurionite is slightly soluble in water, more so in hot water. Association: It occurs associated with paralaurionite, penfieldite, fiedlerite, phosgenite, cerussite and anglesite.